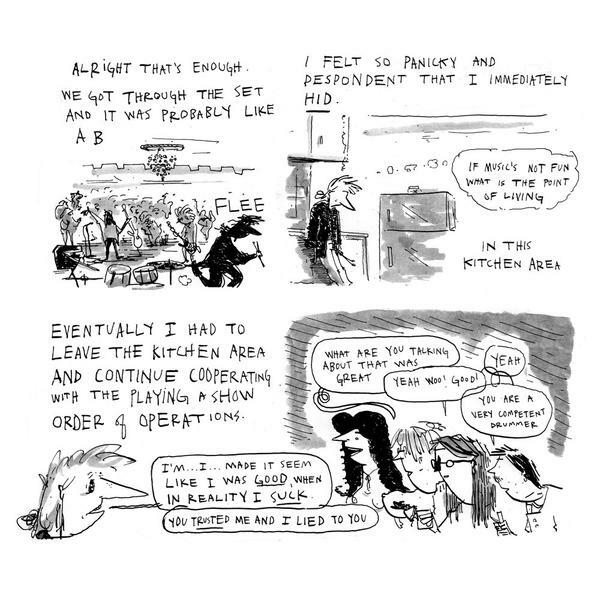 Black & White Diary Comics December-February 2017, by Sara Lautman. Lautman helpfully explains the entire premise of the mini in the title, and Birdcage Bottom Books published this collection. 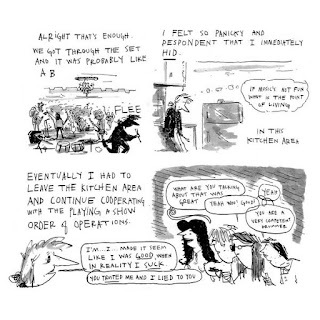 Lautman's comics have always been funny and strange, as she has always resolutely told her stories from a point of view that she never tries to explain or justify. Visually, her comics have always had a rock-solid and conventional formal sense of design, allowing her to get as wildly expressive as she wants with regard to figure drawing. Lautman is also consistently funny; sometimes it's dry humor and other times there's an over-the-top sense of "How can this be happening?" A good example is the first strip, "Crisis Hotline". Lautman, with an cartoonishly exaggerated nose and scribbly hair, calls up a crisis talk line. Lautman spills her problem to the person at the other end of the line (which was redacted) gets silence for a moment, and then a request for FaceTime (!). In one of those unbelievable moments, the call monitor is wearing a dog puppet on her arm and speaks in a dog voice ("That must be rrrruff!") until she breaks off in a fit of coughing. Tack on an awkward denouement, and you have a perfectly structured gag. Lautman often builds her stories around a vague sense of discomfort. Whether it's singing alone at a karaoke night and trying to connect to some bros standing up, or a feeling of extreme anxiety as she steps in as a band's new drummer, Lautman always manages to feel out of place. There's a hilarious scene where she confesses to her friends what a horrible job she did and how sorry she was, and all she got was wonderful feedback. "Stupid supportive friends" she thinks, as she slinks away, as no one will feed her sense of inadequacy. That said, Lautman doesn't wallow, at least not without trying to generate laughs. There are also absurd, silly anecdotes, like attending "Gum Brunch" (which is exactly what it sounds like) and discussing the history and reverberations Gum Brunch has stirred up. There's another story where an older man approaches her in a bar, compliments her on the band t-shirt she's wearing, then walks away when she says the shirt was a gift and she wasn't really a fan. That all seemed standard until a woman runs up to them and says that that man was her uncle, and that this was the first thing he had said in thirty years! 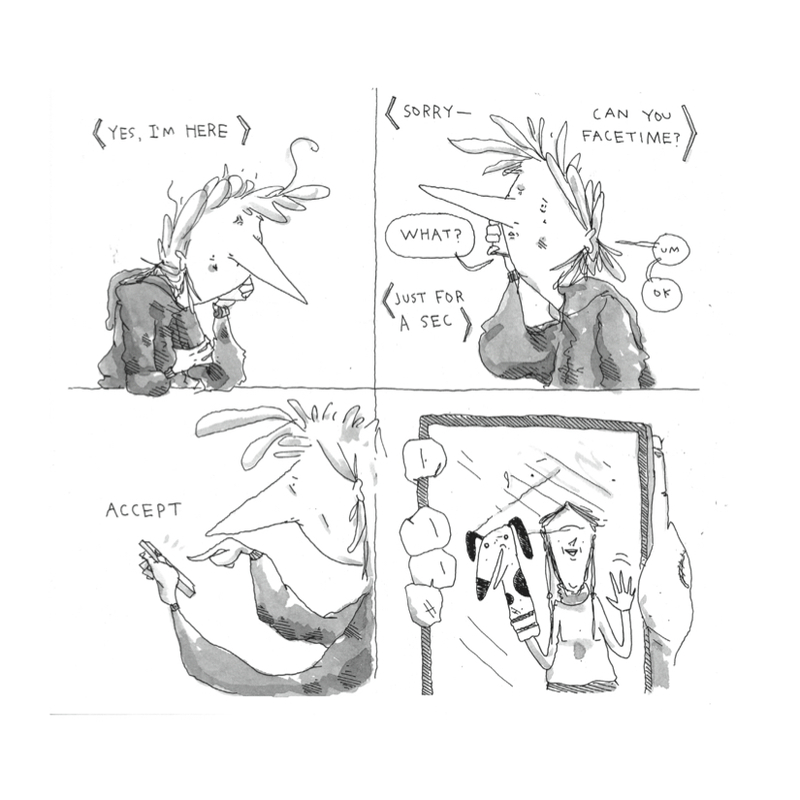 Lautman writes herself as a weirdness magnet even as she's finding it hard to deal with normal life, but she deals with both with a sort of deadpan humor that's accentuated by that appealingly scratchy, scribbly style. 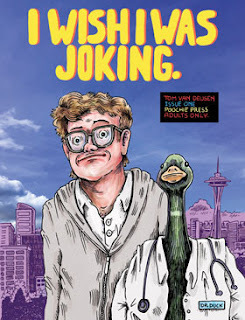 I Wish I Was Joking, by Tom Van Deusen. This is a collection of odds and ends from Van Deusen from various anthologies; and as such, it has a slightly scattered feel. Van Deusen's favorite new character seems to be amazon.com head Jeff Bezos, and he is portrayed as barely able to interact with other people. There's a running joke about a disturbing relationship with his AI device Alexa (culminating in a great gag on the back cover) as well as him wrecking Seattle in his "Bezos-Bot"; essentially, it's Mecha-Bezos. It's sort of like a toddler having godlike influence on his world. A lot of the humor in the anthology is centered less on Van Deusen (usually the star and main target of his stories) and more on various celebrities. There's an uncomfortable, extended sequence where Van Deusen visits the home of Dave Matthews, who as it turns out (in this story, at least) is a coprophile and discusses this at length. Then there's a visit to an old Real World house, which has fallen into total savagery since the cameras left. It's a bit of low-hanging fruit for Van Deusen. More amusing are "Undercover Grandpa" (exactly what it sounds like), which gets especially weird when the grandpa dies and leaves his grandson his head in a jar, which is then programmed to say all kinds of disturbing things. Then there's a strip where Van Deusen goes to the doctor, who winds up being a lab-coat wearing, stethoscope-wielding duck. It's not an anthropomorphic duck either--just a duck. It's total lunacy, as the duck goes wild and tries to attack Van Deusen. 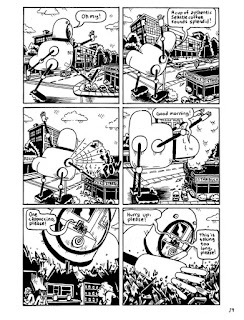 Overall, Van Deusen's best strips are the "autobio" strips where he portrays himself as an awful person, because they are both funnier and cut deeper, even when they stray into total fiction.